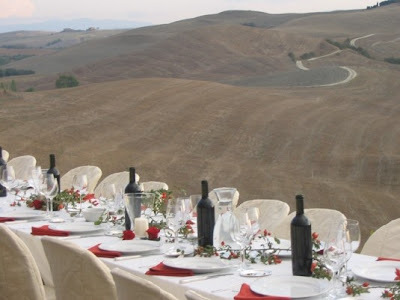 Have you considered a wedding in Tuscany? This fall, Gabriella and John will be married in the beautiful hills of Tuscany. The above picture is what it looks like now, but they say it will be beautiful and green in the early Fall like below. Many people think destination weddings are too expensive, but depending on some of your priorities for your budget, it may not be out of reach. Gone are the days with ballooning guest lists, insane quantities of food. Today’s bride is focused on intimacy, delicious food and drink. As we see a downturn in the guest lists, I have found that dollar to euro, many of our weddings are costing the same, whether it be on swank affair on the San Antonio Riverwalk or in the hills of Tuscany.